Whether you need insurance for a large articulated lorry or a van you use to go to and from the cash and carry, we can help. 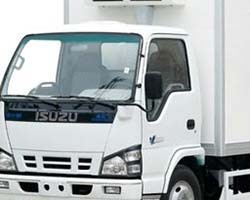 This service offers quotations for any sized refrigerated vehicle, whether as a single van or as part of a fleet. Whether your van is a compact car derived vehicle, a panel or box van or a large HGV, if it's fitted with insulation and a chiller unit device, you will need specialist insurance cover. There are only a few insurers willing to cover these vehicles, and many of those are accessible via this service. The market is limited as fewer insurers are willing to underwrite the additional risks associated with such vehicles, which tend to be higher value given the cost of replacing the insulation and refrigeration units. To get the widest choice of quotations, simply fill out your details below, or alternatively, if you prefer, call for a quote over the phone. Companies able to offer telephone quotations include Autonet (0800 080 5295 quoting reference 9032) or Insurance Choice (0843 2270120). Firstly take time out to list all the possible uses of your refrigerated van, lorry or truck. If you are not going to take your van out of your local area, you don't need European cover. If you are only using your van or lorry to deliver goods from your shop to local residents, you don't need haulage cover. On the other hand, it's a good idea to consider uninsured loss cover so if you need to rent a replacement vehicle as yours is off the road due to a non fault incident it won't be expensive.